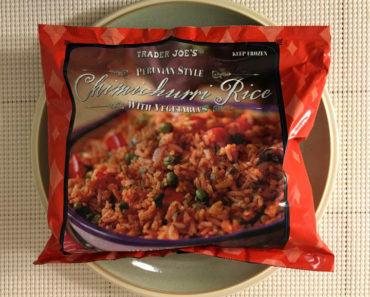 We’re always a bit wary to pick up a pizza at Trader Joe’s. 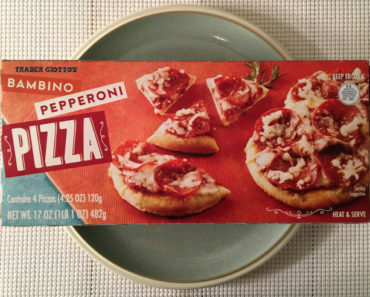 It’s not because Trader Joe’s makes bad pizzas — quite the contrary, in fact (though they do make at least one pizza we didn’t care for). But pizza boxes can take up a lot of room in our freezer. Since our freezer is constantly packed full of goodies (which is how we prefer it), it’s hard to justify picking up something that takes up too much space. 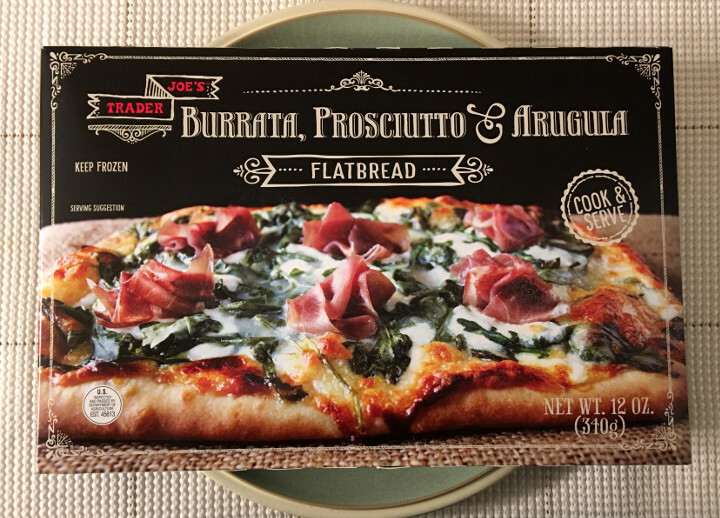 However, when we saw Trader Joe’s Burrata, Prosciutto & Arugula Flatbread Pizza, we knew we were going to make an exception. Now, this thing has a bit of an unusual cooking process. You’ll have to take the pizza out of the freezer before you preheat your oven, since the pizza needs to thaw for about 20 minutes before it’s ready to be cooked. On top of that, the prosciutto needs to thaw as well, and you won’t put it on your pizza until it’s done cooking. 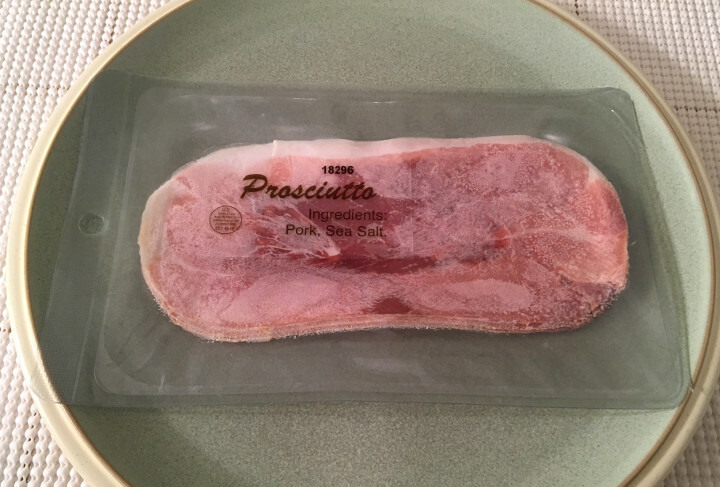 Our packet had three slices of prosciutto in it, though they’re large enough that they can be torn into smaller pieces if you want. It’s not a difficult process; it’s just not your ordinary just-stuff-the-thing-in-the-oven routine. It also means that if you’re sharing this pizza a vegetarian, you can just put all the prosciutto on one half of the pizza and leave the other side meatless. After we pulled our pizza out of the oven, we tried to crinkle the prosciutto so it looked all fancy like the picture on the box, but it’s harder than it looks to give it that classy appearance. You can take a look at the image below and judge how well we did. In case you couldn’t tell from the title, this is not your traditional pizza. This has a blend of burrata, mozzarella, mascarpone, arugula, romano, parmigiano reggiano, and fontal cheeses. This mean it has a fancier taste than, say, something you’d have delivered at 2 a.m. We think it’s fantastic. If you’re unfamiliar with the stuff, prosciutto is a thinly sliced salted pork, yet it has a flavor that codes as slightly seafood-y to us. 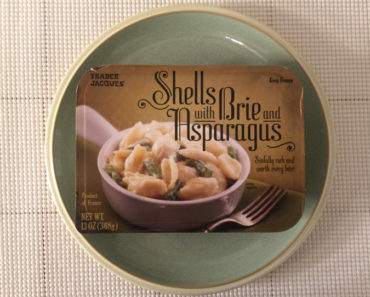 We’re not sure everyone would agree with that, but we definitely think this tastes less like ham than you might expect. It’s a good topping here, but even if you decide to leave it off, the pizza still tastes great. 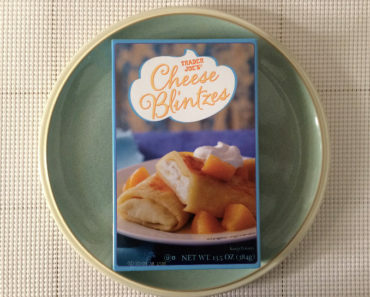 The box calls this thing three servings, and we vehemently disagree. This is a pizza for two people at most, and even then it becomes more of a side dish than a meal. If you put this whole pizza in front of a very hungry person, they’ll polish off the whole thing without a problem. 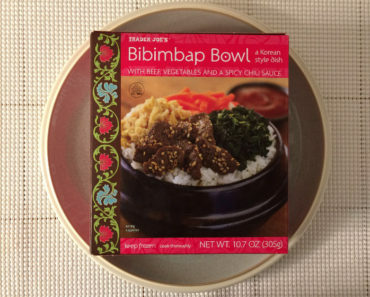 One serving contains 290 calories (110 from fat) and 670 mg of sodium. That means the full pizza has 870 calories (330 from fat) and 2,010 mg of sodium. That means this pizza is off the table if you’re on any sort of diet — especially if you’re trying to cut back on your sodium. 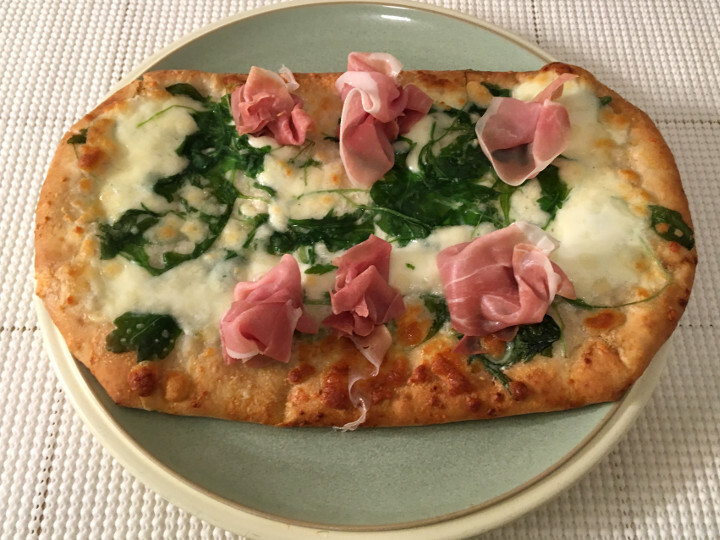 Trader Joe’s Burrata, Prosciutto & Arugula Flatbread Pizza offers a fancier take on pizza — this is the sort of pizza that got cleaned up for a formal ball. We think it’s amazing. 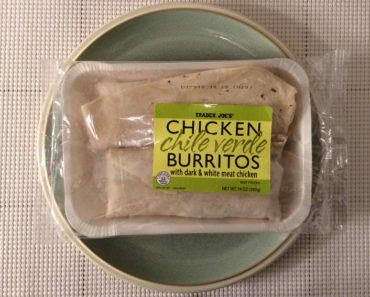 However, be prepared to be loaded up with calories and sodium if you decide to eat one of these. 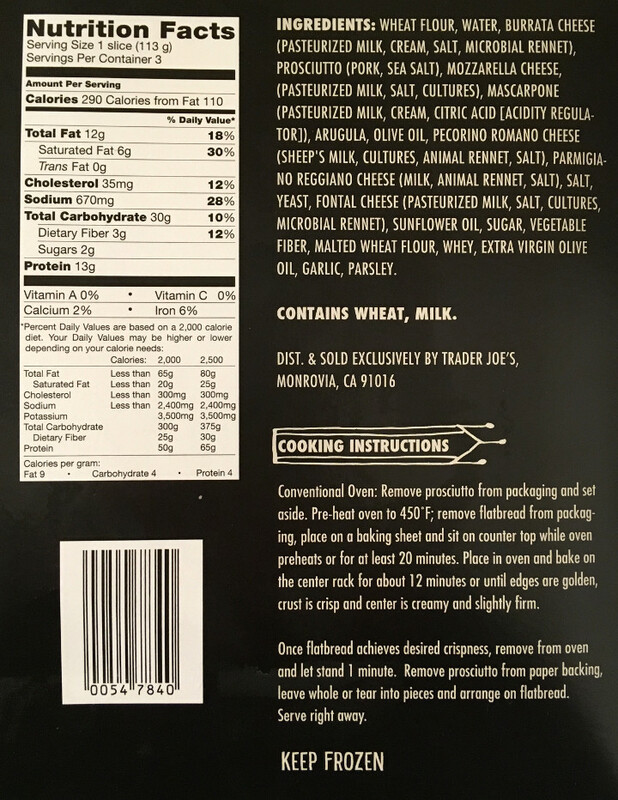 To learn more about the cooking instructions, ingredients, or nutritional content in this Trader Joe’s flatbread pizza, check out our package scan below.